It took a while to finally heat up in Texas, but now, we’re in the thick of it. Now, the garden gets water twice a day instead of once, and an 85-degree morning actually feels cool. Heck, even a 100-degree day is bearable with a breeze! This means a few things: summer squash harvest is in full swing, and easy, barely-cook dinners are necessary. I love meals that can be eaten hot or at room temperature. While I chase a toddler around all day, I find myself with odd pockets of time in which to make dinner. Around 4pm every day, Camille will settle into some time with her new magnet board (which I made so easily slapping an IKEA frame on a $30 piece of sheet metal from the hardware store!). This is my time to either rest or make dinner. I often choose dinner. 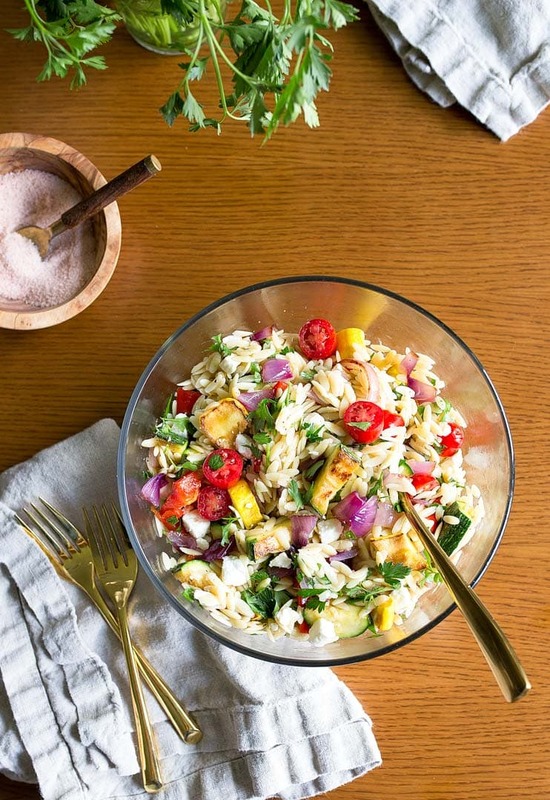 This orzo pasta salad with feta and grilled vegetables comes together in about 20 minutes, provided you start everything around the same time. Plus, it’s delicious after it sits and cools, too. I serve it at room temperature frequently, and I also send my husband to grill chicken breasts to serve on top. First, put the water on top boil and heat the grill pan (or outdoor grill, whichever you prefer). Next, chop your veggies in large chunks, and get them searing on the grill pan. Drop the pasta into the water to cook according to the package directions, and make your dressing. So easy! I copied this recipe from one of my mom’s most famous side dishes: her lemon orzo pasta salad with parsley. It’s so simple, really, just cooked pasta in a lemon slippery vinaigrette with fresh herbs on top. She serves it often with a rotisserie chicken or grilled pork tenderloin, and I find myself enjoying it even more than the meat. I’m a closet vegetarian, you probably knew this if you’ve been around here for a while. I go back for seconds of my mom’s orzo pasta salad, and I always try to take a dish home, too. At home, I love to add feta and eat it cold straight from the fridge. Finally, I decided to turn it into a main dish with the addition of grilled vegetables. My perfect dinner has been found. You can use any summer vegetables you like; I grabbed an assortment from the garden. Eggplant is especially nice here, mushrooms are always welcome (if you like them), and any type of squash. If you have the big, beefy tomatoes, slice them in half and grill them for just 2 minutes to add a smoky, juicy bite to the salad. If you’re not a feta lover, I recommend Parmesan cheese shavings, the big curls made with a vegetable peeler. You’re looking for a salty bite in this salad. What about the rest of the lemon?, you might ask. Honestly, I squeeze it into a pitcher and make a quick lemonade with maple syrup for my daughter, whom I still deny juice (heh). You really only need the lemon zest for this recipe to impart its zingy flavors into the olive oil. Does it go without saying that high-quality olive oil is best to use in a raw dressing like this? I sure hope so. Also, add any kind of grilled meat you like. Sliced grilled chicken is tops here. We can usually get one dinner for two out of this, with maybe a scoop or two leftover for a side dish the next day. As for dessert, it’s never too hot to turn on the oven to make small batch chocolate chip cookies. 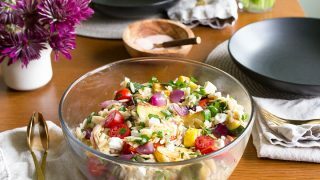 Orzo pasta salad with feta and grilled vegetables is a delicious, easy summer dinner for two that comes together in just 20 minutes! In a serving bowl, add the lemon zest, 1 tablespoon of the olive oil, salt and pepper. Whisk to combine. Set aside. When the pasta is boiling, add a handful of salt and the orzo pasta. Cook the orzo according to the package directions. Meanwhile, chop the veggies into large chunks for the grill: slice the pepper in quarters, slice the squashes in half length-wise, and slice the onion into 2 or 3 slabs. 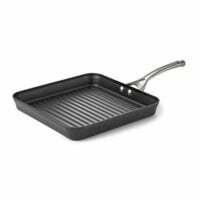 Preheat a grill pan (or outdoor grill) over high heat. Drizzle olive oil in the pan, and then arrange the veggies in the pan. Cook for 5 minutes, check for grill marks and flip, and then cook on the second side until more grill marks form. Remove the veggies from the grill, and let cool slightly. Finally, drain the pasta and add it to the serving bowl with the vinaigrette. Toss well. Add the sliced cherry tomatoes and feta to the pasta, and toss again. 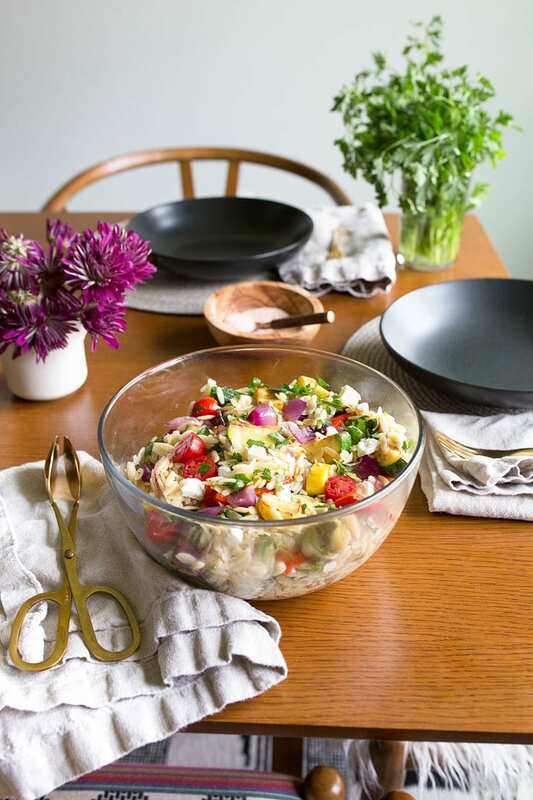 Chop up the grilled veggies into bite-size pieces, and add the serving bowl. Toss everything together very well, and then garnish with chopped fresh parsley. 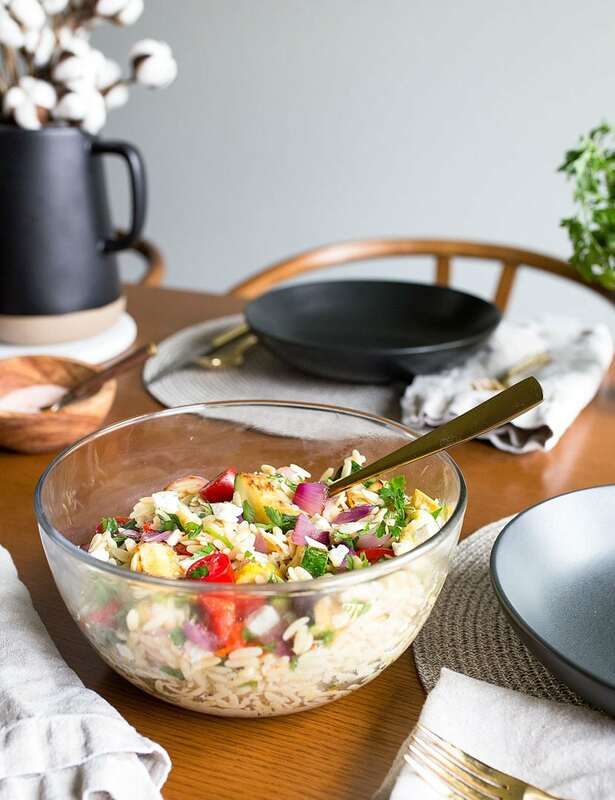 This orzo pasta salad with feta and grilled veggies will keep for up to 3 days in the fridge, tightly covered. coming back to the recipe, I already mentioned it after watching the video, I enjoyed the idea of mixing warm pasta with dressing to let it cool down while it infuses with the dressing. This looks a like a winner idea to me. Made this for dinner last night, and it was delicious! I loved loved loved the lemon zest taste in it! I had made pasta salad with grilled veggies before, but the warm dressing infussion gives such a nice twist to it. I love it how it increases the lemon flavour! Please DO share more tips like this one! This was delicious! It will definitely be a recipe that I make regularly. I had to leave out the cheese because my husband isn’t eating it these days, but it wa still delicious. Thank you, Christina! This would also be good with Middle Eastern Couscous as it is known at Whole Foods. The grain is larger than regular Couscous. You’re right! I love couscous!